The Bay of Fundy has countless—often free—small car ferries that connect the small Fundy islands to the mainland. In addition to these small ferries, Bay Ferries also operates what is know as the ultimate shortcut to the world’s highest tides. 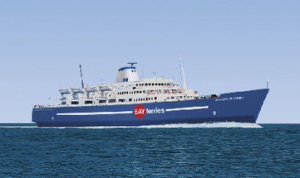 They offer a three hour Fundy-themed cruise across the middle of the Bay of Fundy on their Princess of Acadia Ferry that links Saint John, New Brunswick to Digby, Nova Scotia. The ferry carries all vehicle types, including RVs and motorcycles. Walk on passengers are also welcomed. The Princess of Acadia provides a unique Atlantic Canadian route that saves on driving and makes getting to your destination an adventure of its own. I will be in Halifax this summer and was wondering how to get to the Bay of Fundy for whale watching. Also, can you recommend someplace to stay and also whale watching tours. The closest spot to go whale watching in the Bay of Fundy near Halifax would be the Digby area. Take a look at this page for whale watching companies: https://www.bayoffundy.com/listings/area/digby/type/whale-watching/. You can use the filters found on that page to find some nice places to stay. For example, if you were interested in a B&B take a look at https://www.bayoffundy.com/listings/area/digby/type/bed-breakfasts/. Hi Ruth, the easiest way would be to drive. You could either drive to Campobello Island (which will be closest) or you can drive up and enter Canada via St. Stephen. From there it’s a relatively quick trip to St. Andrews or even St. John. Where you should go and stay really depends on what you’re looking to get out of your trip though. If you’d like more help, please send a quick email with what you’re looking for to [email protected]. How can I travel to Saint John or Yarmouth (or anywhere Canadian) from Bar Harbor, other then driving? Thanks! You could take a 20 minute drive from Bar Harbor to Hancock County-Bar Harbor Airport near Trenton. From there you could fly to Boston using Cape Air (https://www.capeair.com/). And from Boston you can fly to Saint John (NB), Moncton (NB) or Halifax (NS). That being said, in my opinion driving is by far the best way if you’re that close already. Saint John is “only” a 4 hour drive from Bar Harbor and it’s quite a scenic route. I am not 100% sure, but there might also be tour buses that you could take. Now, I would need to know how to get to Brier Island from Digby, when you don’t have any car…well, are on your feet ….and how much money should I plan for it, and also for the St-John’s ferry to Digby and other ferries…? I just wanted to know if there would be any ferry that goes dirctly from St-John’s NB to Brier Island NS ?